As of October 1, 2017, late fees will no longer be waived for payments mailed to the P.O. Box and received after the due date on the 10th. NSCIO will be hosting their annual Halloween Party & Hayrack rides on Oct. 31. Monetary donations or candy may be left at City Hall and will be picked up by a NSCIO member. New Strawn is thankful for the many volunteers and NSCIO members who make this event such a fun and successful one each year! New Strawn is holding a ‘Lawn of the Month’ contest for October! The lucky winner will receive $25 in Chamber Bucks and will have the ‘Lawn of the Month’ sign placed in their yard. Judging will be on Friday, Oct. 20th so make sure you have all your lights, props and spooky stuff on display that evening for the judges! We’ve got some ‘spooktacularly’ decorated lawns in and around town so be sure and take a cruise to see them! Due to lack of a quorum, the New Strawn city council meeting on Oct. 12 was adjourned to Wednesday, Oct. 18, 2017 at New Strawn City Hall. City Hall will be closed November 23 and 24 for Thanksgiving. You may pay your bill online or drop a payment in the box on the front of the building. If you have a water or sewer emergency please call the city superintendent at 620-364-9135. Ho Ho Ho…guess who’s coming to town? The City of New Strawn and the Coffey Co. Library – New Strawn Branch will be hosting a Christmas event on December 1. We’ll be decorating and lighting the Christmas tree in front of City Hall, caroling around town and eagerly awaiting an appearance by Santa at 7:15 p.m.! Please click on the link below to view the flyer. 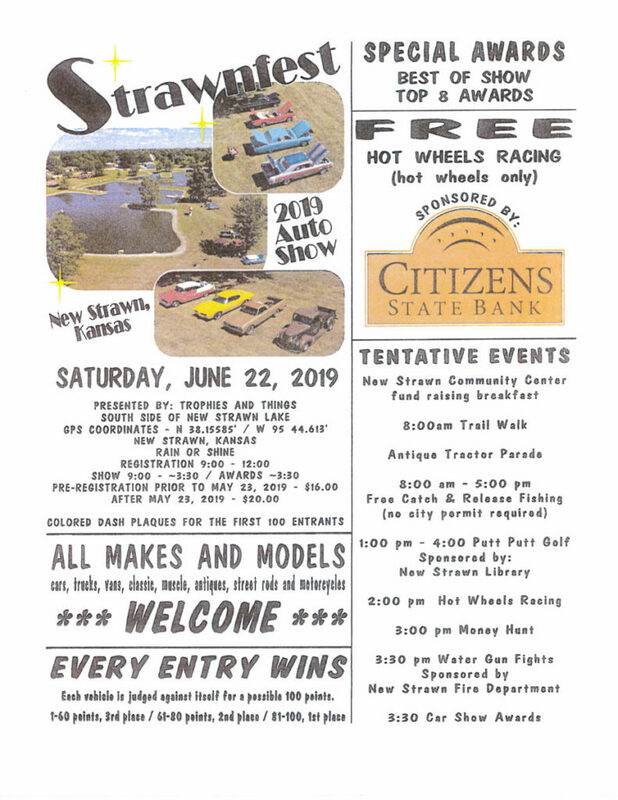 There will be a meeting held at City Hall on Dec. 5, 2017, 6:30 p.m. for anyone interested in being on the Strawnfest 2018 committee. New Strawn City Council will meet on December 14, 2017, 7:00 p.m. at City Hall. Regular council meetings are held the second Thursday of each month and are always open to the public. To see agenda and consent agenda, please click on links below. December Lawn of the Month Winner!!! Sooooo MANY great Christmas Displays this year!! It made it extremely hard to pick just one winner! Thanks to EVERYONE, all over town, who made New Strawn ‘shine’ this holiday season! Tuesday, January 16, 2018 @ New Strawn City Hall – 7:00 p.m. The New Strawn Planning Commission will meet February 13, 2018 at 7:00 p.m. at City Hall. Lawn of the Month Contest – October Winner is Robert Foster! Veterans Banners Now on Display! December Lawn of the Month Contest ~ Winner will be announced December 21st! 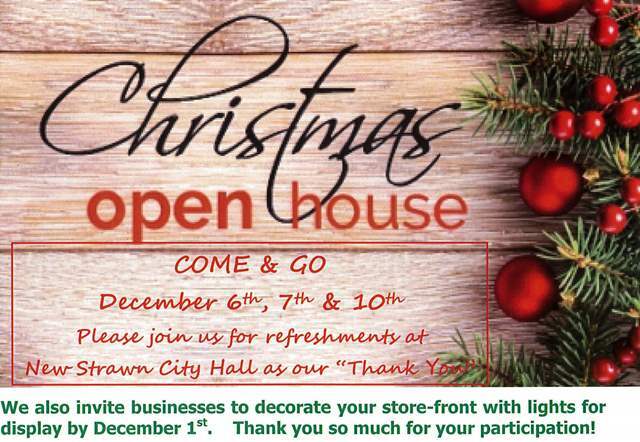 Please join us at our come and go Christmas Open House! We will have refreshments on the 6th, 7th and 10th of December. There will be a sign-up sheet if you are interested in volunteering for community events such as Strawnfest, Halloween Party, Easter Egg Hunt, Community Clean up ideas, etc. Lawn of the Month Contest – December Winner Mike & Deb Stukey! LOST & FOUND ITEMS ~ Shoes and toy found at park. Come in or call with description. FIRE FIGHTERS FUNDRAISING BREAKFAST~ April 20 starts at 7 a.m.
Fundraising Breakfast will be held Saturday, April 20 beginning at 7 a.m. at the New Strawn Fire Station. All proceeds go to the New Strawn Firefighters Activity Fund. Freewill donation. The New Strawn Community Improvement Organization (NSCIO) will be hosting the annual East Egg Hunt Saturday April 20 at the New Strawn Community Building. The time for the event is tentatively set for 10 a.m. for children up to age 11. The Easter Bunny may ‘hop in’ for photo ops! If you would like to donate candy for this event, you may drop it off at City Hall by April 1. Contact is Brenda Klubek at (620) 203-0115 for more information. Filling hundreds of eggs with candy and prizes is time-consuming and NSCIO always welcomes more volunteers! Shipped-in farm products which cannot be grown or are not in season in Kansas and which are NOT in competition with local products may be sold. The Farmers Market will begin June 5 and will run through the last Wednesday in October. The Market is open Wednesdays from 3 p.m. to 6 p.m.
New Strawn City-Wide Cleanup will be held in conjunction with Coffey County’s designated cleanup week of May 13-17th. Residents are encouraged to place items curbside by Monday, May 13. Items should be separated into the following piles: brush (no longer than four feet, tied into eight-inch bundles), furniture and treated lumber; metal and regular trash. Items that will NOT be picked up include tires, batteries, paint, hazardous materials and any containers of liquid. City employees will only pick up items within city limits. Coffey County Taxpayer (Floodplain) Open House May 16 at 4-H Bldg in Burlington 2-7 p.m. The Kansas Department of Agriculture – Department of Water Resources is currently in the process of producing updated floodplain maps for all of Coffey County. This project has the potential to impact flood risks, tax rates, appraisal values, insurance rates and mortgage availability. There will be a Public Open House held on May 16, 2019 from 2 p.m. – 7 p.m. at the 4-H Building in Burlington. Taxpayers will have the opportunity to meet with floodplain experts to discuss the potential changes as well as the opportunity to talk with insurance agents about insurance options. All taxpayers are encouraged to attend. If you have any questions or concerns, please contact Cara Mays, Coffey County GIS Coordinator at 620-364-8426 or [email protected].